We’ve been skiing as a family for the past 5 years; the last 3 of which included our youngest, aged 4, and each time it gets better and better. I’d probably go as far as saying that I prefer a family ski vacation to a hot summer holiday! 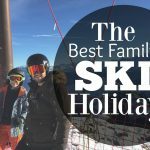 I think that the assumption is that family ski holiday’s are all about, well, skiing, but that’s not strictly true and as you read through these secrets to a successful family ski trip, you’ll see just what I mean. I will concede that there are more components to consider when you are planning a family ski trip; hotels or self catered, flights or self-drive, get your own gear or ski hire, making sure you have the right clothing, winter sports insurance, lift passes etc etc – but having been a few times now, these elements all become second nature and you soon find your preferences and what works for you as a family. Not to mention the fact, when you find a great tour operator like Peak Retreats, they’re more than willing to make it as easy as possible for you. Anyway, let’s get on with the secrets to a successful family ski trip. It’s small. Skiing is a fast, dangerous sport and the very last thing you want to be worrying about is skiing down a blue run with you children AND being constantly blind-sided by the ‘lads on tour’ hurtling down the slope. Sainte Foy has wide, calm and gentle pistes that are perfect for all-ability family skiing. Everything is close by. It’s inevitable that, as a parent, you’ll end up carrying not just your own gear but the kids’ as well. Having the lifts, the restaurants and the accommodation close by makes this just about bearable. Variation. Sainte Foy has a whole host of differing slopes, catering for all-abilities. This means that for those odd occassions where you might get to shoot off on your own, you can still get some great skiing under your belt. A great ski-school. This year was Teddy’s first time in ski school. To be honest, getting him to go to normal school here in the UK is hard enough but he did do a couple of sessions and I cannot speak more highly of the instructors in Sainte Foy for the ESF. They spoke brilliant english, they were caring, reassuring and nurturing not to mention absolute pro’s when it came to teaching 4 year-olds how to ski. By the end of the week they were tackling the chair lifts and conquering the blue runs. Yes, 4-year-olds! Extra activities. I will touch on this a little later, but when researching for a great family friendly ski resort, look and see what extra activities are on offer. Once you have the right resort, like Sainte-Foy, the next thing is to choose the best accommodation. When taking the family on a ski trip, where you stay is crucial. You want something home from home so that all your routines, your comforts and lifestyle habits can remain the same meaning minimal disruption for the kids. The last few times we’ve been skiing as a family with Peak Retreats, we have stayed at CGH self catering apartments and we really love them. They’re self-catered which suits us down to the ground. Our most recent stay was in Le Ruitor, Sainte-Foy. It was in a great location for the ski lifts, with a 2-minute shuttle bus taking to directly to the slopes. It was in a quiet neighbourhood, which is also excellent for the kids when it comes to getting them to sleep! We had a spacious 2 bedroom apartment, fully stocked kitchen & bathroom, drying room, ski lockers, an underground car park and full access to the spa, pool, sauna and steam room! An essential consideration when you’re looking for accommodation is a swimming pool. Whilst I would happily spend most of the day on the slopes, the kids will need a bit of something different and having a pool on demand is super helpful. Another top tip is to choose accommodation that’s close to the slopes. In my humble experience, it’s usually dad who gets loaded up like a pack pony, carrying everyone else’s gear. Ski poles, boots, helmets, jackets, goggles, ski’s, backpacks, lunch, the list goes on. Being close to the slopes will definitely make life easier. For us, staying at Le Ruitor, we were close enough to walk if needed, but they provided a 2-minute shuttle bus which was so helpful. It was very convinient. There are not many things more annoying than getting to the top of a chair lift with the kids at which point they turn round and declare that their boots are too small, their helmet doesn’t fit, they’ve lost a glove and their lips are sore. Check, and double check that everything fits and that you have everything with you. Have a look at the weather before you head out of the resort and up the mountain as this will inform what you need to take with you and what you don’t. I’d also recommend layers for your kids. It’s easier if they’re hot, to take off a relatively thin layer to stow in your backpack than wrestle with a thick coat or jumper. Variety is the spice of life. Well, it is for kids who can get bored with constant skiing pretty easily. The way we approach our family ski trips is by spreading out the skiing. We’ll try and ski every day, but sometimes just the morning, or afternoon, sometimes just for a couple of hours, sometimes we’ll break it up with lunch up the mountain etc etc. You get the point. In the times you’re not skiing, it’s important to have other activities to do. For example, Sainte Foy and La Rosiere have snowshoeing, husky rides, Paret, ice skating, swimming, bowling and more. It’s also worth noting that where I come from, eating counts as an activity. Enjoy the apres ski restaurants, cafes & bars. Ted and I loved just going for a hot chocolate together. We sat, chatted, answered some bizarre toddler questions, watched some Eurosport and hung out together; such fond memories. This crucial advice for any parent for any time, but even more so when you’re away on a family ski trip. Children get peckish at the best of times but when you’re 2500 metres up a mountain, you’re fairly limited as to what you can rustle up. Consequently, it’s worth filling your bag with snacks and drink. And plenty of it! There’s nothing wrong with flying somewhere for your family ski trip, but having driven twice now, it really is a lot (logistically) easier. You can take more with you as you’re not limited by baggage weights, which means you have more of your own creature comforts; things that are far better to have with you when you’re taking the kids than not. We drove from South East England, hopped on the Eurotunnel and within 45 minutes were well on our way into France. It was quick, easy and convenient. You have to keep in mind the tolls adding to your overall costs, but we found it worked out much the same, if not cheaper than flying. Having the car also means you can explore local resorts more easily to again add to the variety of your family ski trip. 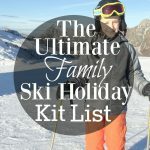 A family ski trip is not going to happen seamlessly, (but what holiday is when you’re taking the sproggles), but if you’re well organised, well planned and nailed the essential components that I’ve outlined above, you’re sure to have a fantastic family holiday filled with memories that will remain with you, and your children, forever. We’d highly recommend it if you’re considering going for it. For more information about Peak Retreats, and Sainte Foy, Tarantaise be sure to check out their website, and social media channels below! The Best Family Ski Holiday?